Holocaust Survivors: Photo Gallery - "Auschwitz Record of Transfer to Dachau, Page 1"
This is page 1 of an original document from the archives of the National Museum of Auschwitz-Birkenau. It concerns a transfer of prisoners from Auschwitz to Dachau. A subsequent page of this document lists the name of prisoner Solomon Radasky (Slama Radosinski) Auschwitz No. 128232. 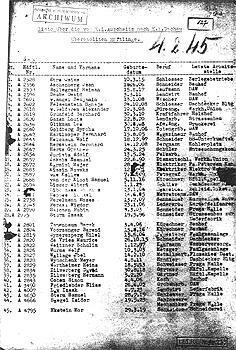 It is dated February 4, 1945 and is in numerical order of Haftling (Prisoner) number, beginning with A 2528. Mr. Radasky, Prisoner number 128232 is the 1043rd person on the list. His profession is listed as Schneider (Tailor).